One of the seven churches of the Bible, as the last church known as the luke-warm in Reveletion, Laodicea is situated in Denizli province. It is easier to reach and it takes only fifteen minutes by coach. Laodicea is noted all over the world by its splendid archeological site still under the excavations in one hand. 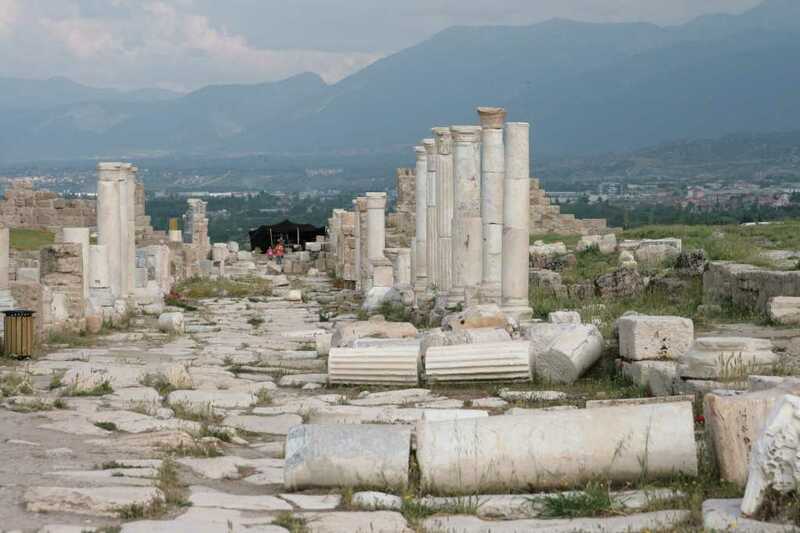 On the other hand, Laodicea has become one of the holy destinations for church groups with tours called on the footsteps of the Apostles in recent years. Church groups not only have a mass in Cross church but also walk in the ancient streets and see the amazing water pipe systems of the city in holy atmosphere. 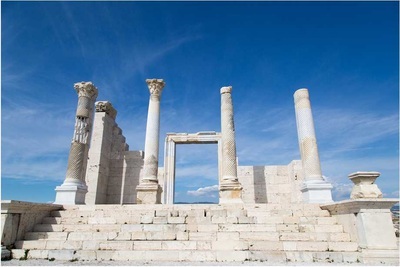 Laodicea is located 6 kms north of Denizli and was established in a very convenient spot on the bank of the river Lycus in 263 BC by Antiochus II. It is said that Antiochus’ wife, Loadikea has given her name to the city so it has been called as Laodicea in the history. Today the ancient Laodicea is being excavated by the archeological team of Denizli University in the name of Turkish government. Laodicea was founded in 3rd C BC as a Hellenistic town after the death of Alexander the great. The city is at the crossroads of important routes of the antiquity depending on the convenient topography for military, administrative and economic facilities so it became one of the main hubs in Asia Minor in Roman times. Ancient historians tell us that a black sheep with a very soft black wool and a purple dye, eye ointment for sick people whom they had eye-ilnesses, second banking center after Ephesus in Asia were the leading industries and the main income sources of the city’s wealth. 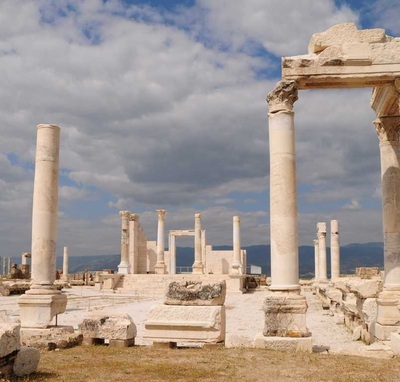 Laodicea was the most magnificent and richest city in the time of emperor Tiberius in 14-27 AD that is why the city was told “ Rich “ in the Bible. But the heavy earthquakes made great damages several times in the following years and the one in 60 AD hit the seventy –percent of total city down during the reign of Nero. Rome offered to send some loans to rebuild the cities for Loadicea, Hierapolis, Ephesus and others. All of them were rebuilt by the help of Rome but Laodiceans refused because the brookers in the city became sponsor to make Laodicea again better than before. Development activities in the city during the reign of Emperor Domitian was intense. Gate of Aphrodisias, Hierapolis Gate, Ephesus Gate and the main streets were built in the Doric order. Emperor Hadrian visited the city in 135 AD and supported development activities in the city so the rest of the Roman buildings which are still in better condition today were made in the 2nd century AD. Emperor Hadrian also gave the holy title known as Nekoros-temple wardenship- to Laodicea for the first time after Ephesus. In 2nd C AD Laodicea and Ephesus were in competition in many ways such as banking centres and temple wardenships. In the time of Constantine the great in 313 AD the freedom was given to Christians to worship with the edict of Milan and the city became very important church city for believers. The glory was ended up at the end of the Byzantines and the city was abondended in 10 th AD. 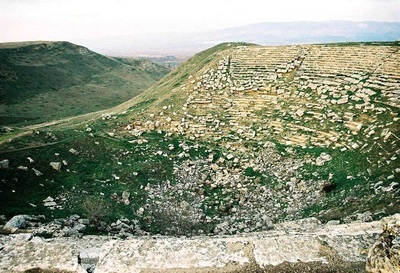 Turkish era began in 12 th AD and Laodicea was left in ruins. In the book of Revelation, Jesus says , “I know what you did. you're neither cold, nor hot. I wish you were either cold or hot! Yet no matter how you are , you're luke-warm so I'm going to vomit out of my mouth" (Revelation 3: 15-16). “ Jesus warns the Laodiceans as to be unstable and unfaitfull to the church because the water in Laodicea is luke-warm, neither hot or cold. In Hierapolis the water is hot and in Colossea the water is cold, in between Ladicea has a shortage of fresh water. 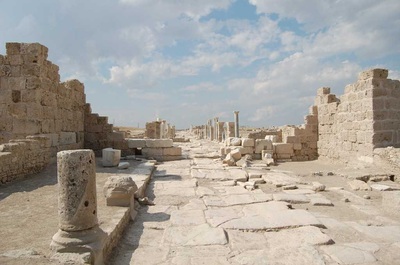 In the time of John, the fresh water was brought from Colossea to Laodicea by terra-cotta pipes and collected in a big water reservoir and was delivered to the city by amazing pipe systems which are visible today. The cold water from Colossea was turning into the lukewarm on the way down to Laodicea and the people living here was like the lukewarm water, unstable and untrustable. The city was a banking centre and called as “ Rich “ but Jesus says, “ You are not rich, you’re poor. Wake up and be faithfull otherwise you will be punished “. It is situated on the north-east side of the ancient city which was built in 3rd C BC as the Greek theater and it was expanded during the reign of Nero so the capasity reached up 20.000 seats as the second biggest amphi-theatre after Ephesus. Nero also was the emperor whom he sent Roman money to enlarge Roman theatres and arenas in Asia. The skene, where the tragedies were performed- is completely destroyed but the cavea-the spectators’ seats with rows and orchestra- the musical shows and speeches were held- are in good condition today. The grand theatre used to be house for many important events, celebrations and festivals. It is about 2000 years old , excavations and restorations on the theatre are still going on. It is located about 300 meters northwest of the grand theatre and was built as the alternative to the big one according to the type of land and was expanded later with 15.000 seats. 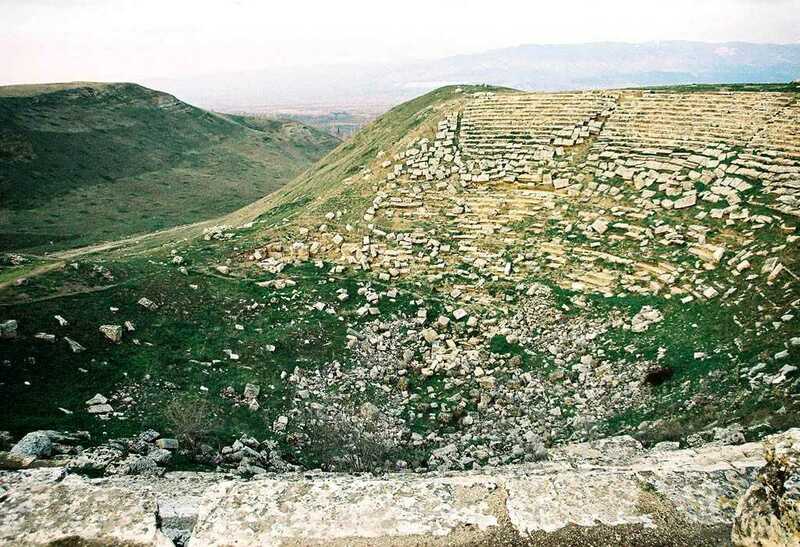 Having two theatres shows us that Laodicea was a really fond of watching shows, listening to concerts, celebrating the festivals, floowing the politicians and so on. As the historical sources indicated and Jesus pointed out the city was really “ Rich “. The skene is completely destroyed, the deterioration on the cavea and orchestra are visible today. It is located in the South-west of the city and lies in the east-west axis. It was constructed as a whole with additional buildings of Gymnasium. The stadium was completed in 79 AD with length of 350 meters, 60 meters in wide and has 24 rows of seats. Archeologists found a written inscription saying that the gymnasium was built in 2nd C AD by proconsul Antonius Gargilius and his wife Sabina and was dedicated to Emperor Hadrian. The monumental fountain is in the between main boulvered and the side streets as the meeting point of Laodicea. It is a Roman structure and was built to deliver free water to the public. As we mentioned before, Laodicea used to have a shortage of water and the water was luke-warm so people were in trouble to drink the clean and fresh water. For this reason, the city authorities gave a great importance to construct such a monumental fountain and a big water resorvoir next with earthenware pipes here. There is a pool and niches on both sides. It was also repaired in Byzantine times. It is located in the southwest of the city in rectangular shape and was extended to the east-west direction later. The main entrance is in the eastern front where the distinguished Laodiceans as politicians, rich merchants, pagan priests and brookers entered the structure and were seated in lower section in order to listen to the talks or to watch the events. It is tought that it was built in 3rd C AD when Laodicea was founded and dedicated to chief diety of Olympians, the king of Gods. It is located between the colonnaded Street and the small theater, in the eastern part of the Nymphaeum-monumental fountain of Laodicea. In Roman era it was called as temple of Jupiter. 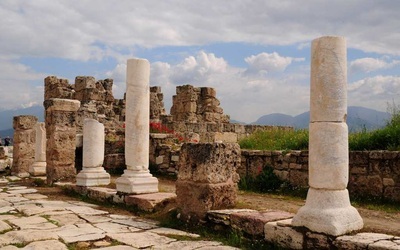 It is believed that there was no permanent church buildings in Asia Minor till the end of 400 AD in Asia Minor so the church of Laodicea was built in 5th C AD during the Byzantine period. All the churches were built on a cross plan as the oblob-building known as “ Basilica “ so there were called as “ Cross Churches “ as it is in Laodicea today. You can find churches in cross shapes all over the seven churches of Revelation cities.